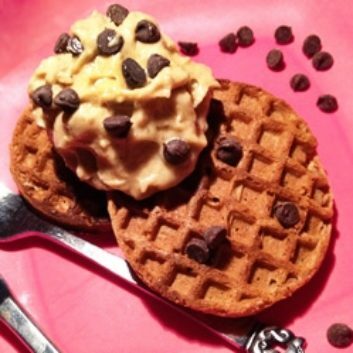 Waffles & Ice Cream = healthy breakfast?! Sounds too good to be true, but it’s not. My homemade PB-Banana Ice Cream (it’s really just pureed bananas!) makes it all possible. Toast the whole grain waffle and top with Peanut Butter Banana Ice Cream. Sprinkle chocolate chips on top. *Get the recipe for Peanut Butter Ice Cream.